I have handled hundreds of copies of eighteenth century Hoyles in libraries and private collections in England and the United States. The most common, those published during Hoyle's lifetime by Thomas Osborne from 1745 to 1767, are rather uniform in size, shape, type, paper. In short, they all feel the same. "London: Printed for Thomas Osborne in Gray's Inn, Stanley Crowder, at the Looking-Glass; and Richard Baldwin, at the Rose, in Pater-Noster-Row." and is undated, also typical of the Hoyles of the time. The book contains the usual advertisement on the verso (Carter, p228) of the title page, saying that "No copies of this book are genuine, but what are signed by us, Edmond Hoyle and Thomas Osborne," yet the book is atypically not signed. And yes, the book felt different. It was smaller than the typical Osborne Hoyle, the paper was thinner and cheaper, the type looked different in ways I could not articulate. The original leather binding was not decorated the same as an Osborne Hoyle. Was this a piracy? The answer came on the last leaf of the book. Observe the colophon, a note at the end of a book giving some particulars about the work (Carter, p68). Here the printer is identified as "Mundell & Son, Royal Bank Close, Edinburgh." Ah, so this was the so-called Scotch edition! Checking references, I found this edition described by Julian Marshall as "an edition printed...by arrangement with the proprietors for Scotch circulation." Based on details in the text, Marshall concludes that it is later than the London "twelfth" edition (1760) , but earlier than the "thirteenth" (1763). It is listed in the Jessel bibliography of books on gaming as number 805. It have found no collateral evidence supporting Marshall's assertion that the book was printed by arrangement with Osborne, but agree with his conclusion. The Statute of Anne (1709), the first copyright law, applied with equal force in England and Scotland. 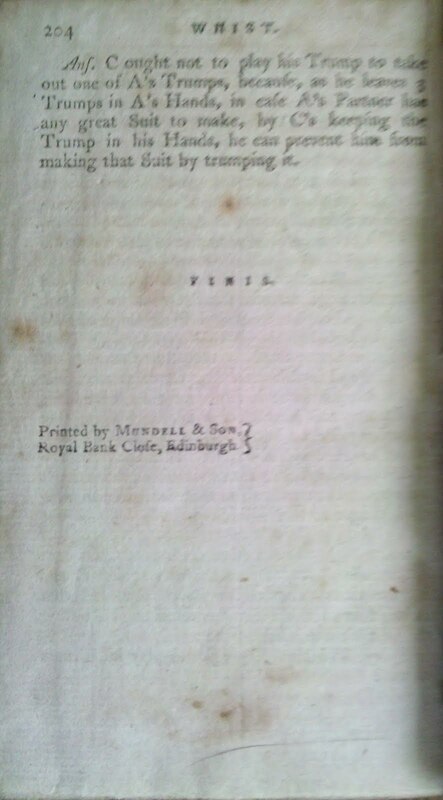 Mundell & Son, a legitimate Edinburgh printer, would not have put a colophon on a piracy. John Carter and Nicolas Barker, ABC for Book Collectors. Eight Edition. Oak Knoll Press and The British Library. 2006. Available for download on the International League of Antiquarian Booksellers website (retrieved June 24, 2011). 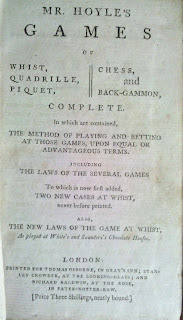 Frederic Jessel, A Bibliography of Works in English on Playing Cards and Gaming. London: Longmans, Green, and Co. 1905. Available for download, retrieved June 24, 2011. 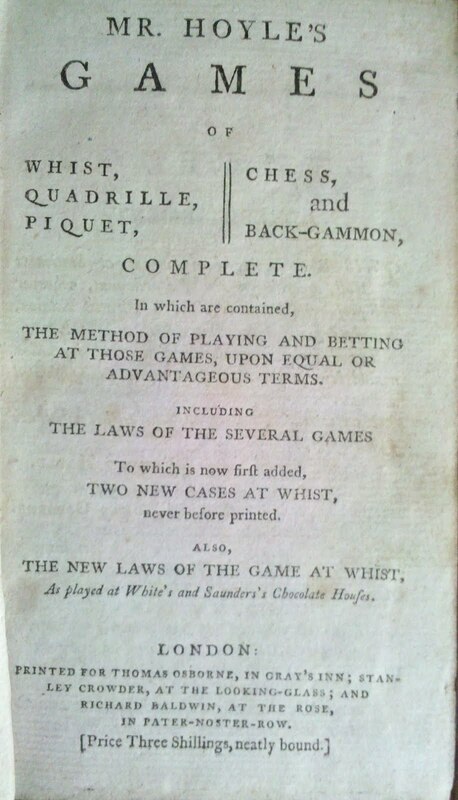 Marshall, Julian, "Books on Gaming", Notes and Queries, 7th S. IX. February 22, 1890, p142.